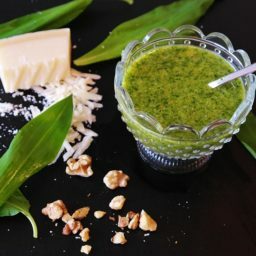 Zesty, creamy pesto; what's better than that? cheaper, but pine nuts are smoother in taste). Grate the lemon zest of all three lemons into the food processor and add the juice of 2 lemons. Add a handful of nuts or two, a clove of garlic and some pieces of parmesan cheese (coarsely chopped). Process until relatively smooth and taste. Add more lemon juice, parmesan, nuts, and garlic as needed. Season with salt and pepper and add a spoonful of olive oil.